The lines, propulsion and even the stance of the new PJ 210, the flagship in Palmer Johnson’s Sport Yacht series, suggests animal power. As she tugs on the lines holding her captive, she looks ready to pounce. Turn on her engines and this 720-gross ton yacht really does - capable as she is of going from zero to 28-plus knots in one minute, 28 seconds. She owes her quasi-animal magnetism to designers Nuvolari Lenard. The Italian firm has been an integral part of the new generation of Palmer Johnsons since the launch of the very first PJ Sport Yacht (a 120-footer) almost a decade ago. As the line grew, the builder and designers pushed each new model into an ever-more daring direction. The first hull of the PJ 170, launched three years ago, inaugurated the use of the vertical bow that also gives such character to the new flagship. Except for her styling similarities with the 170, the PJ 210 is like no other. 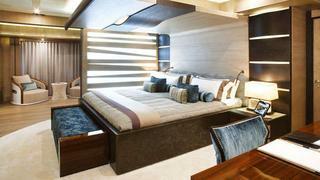 She is a sport yacht with nearly 10,000 square feet of accommodation space (including exterior living space). The owners of Lady M, the first PJ 210 value their privacy, but are so delighted with their yacht, according to their broker and representative, Moran Yacht & Ship, that they have agreed to show her off. The owner’s wife's love for felines is shown in the yacht’s logo of a graceful cat, reproduced on the transom and engraved into a skylight and gates. 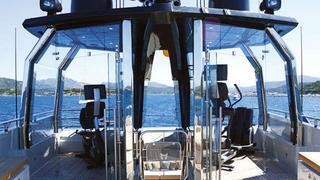 Also capturing the yacht’s powerful yet agile personality is a stunning prow figure—a chiseled jaguar. Nuvolari Lenard designed the Art Deco aluminium figure, roughly six feet in length, to mirror the curves and angles of the yacht. Palmer Johnson built Lady M in welded aluminium in Sturgeon Bay, Wisconsin, USA, the shipyard’s historic home. Construction began more than three years ago, but the world’s financial turmoil put the brakes on its progress for a time. About 16 months from the day the current owners signed the contract, Lady M was ready for primetime, and soon Captain Gordon Scott, who followed the construction from day one, set course for the St. Lawrence River and Newfoundland before reaching Bergen, Norway, to rendezvous with Lady M’s owners. The yacht has been cruising all summer long, around the Baltic first and then the Mediterranean. 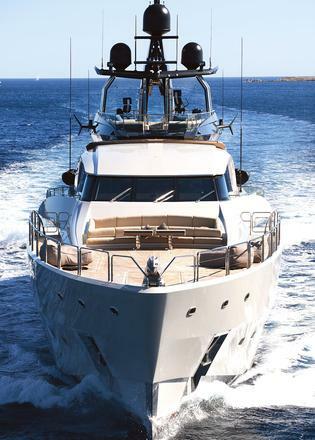 She will be making her public debut at the Monaco Yacht Show on 25 to 28 September 2013 on display with Moran Yacht & Ship. That performance is exactly what her owner, who tried many different options before buying his first yacht, wanted. But dial back to 14.5 knots and she burns about 85 gallons of fuel per hour. ‘Lady M is an extremely safe and comfortable sea boat. We crossed the North Atlantic in under eight days and I was very impressed with the comfort in a seaway. The long, fine bow entry has a lot to do with this,’ Captain Scott says. She will head back to American shores on her own bottom after the Monaco Yacht Show. At the transom, the wide passerelle, beautifully integrated into the teak stairs portside, rises on a scissors-like mechanism that makes it perfectly stable and eliminates any balancing act as you board. The pièce de résistance, however, may be the foredeck, far more complex than first meets the eye. 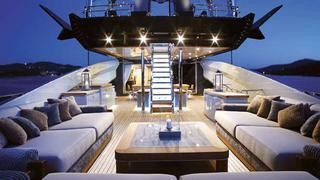 The yacht’s elongated bow area holds a 27-foot tender in a bay that converts to an 11,000-gallon saltwater pool. Two additional bays hold four PWC, and the crane for all of these toys is concealed in yet another compartment. The superb teak deck, which features a custom cat motif, also is a touch-and-go helipad capable of handling a Eurocopter EC145. This means that the hatches had to be reinforced and the stainless steel railing hinged to fold down to allow a helicopter to land. Her enormous aft deck, part of 3,700 square feet of outdoor living space, provides a jaw-dropping experience as you come on board. A 1,000-gallon freshwater Jacuzzi, lined with mosaics and enclosed in glass, occupies a primo position overlooking the swim platform. The platform, which opens to the lazarette and another tender hold, was enlarged on this hull. Up top, under the aggressive-styled radar mast, the owner requested the addition of an outdoor gym. The owner’s fitness regime mandated another modification. In the owner’s suite, the shipyard added a partition to create a private workout space for this early riser who, at anchor, can work out with a sea view. The terrace’s hydraulic shell door was another feat of engineering and craftsmanship. It is lined with teak on the inside and includes the same round portholes found on the portside. The shipyard built teak-lined plugs to fit the space just so. Also highly detailed, the interior décor is festive and warm. Lady M is richly decorated with a mix of veneers—limed oak, wenge, high-gloss rosewood, hand-painted wallpaper, leathers, plush carpets and interesting murals, some of glass treated with different finishes, others of a metal composite with a thermofoil overlay. The owner, guest and public spaces encompass 7,000 square feet, room aplenty for six staterooms, which include the owner’s suite and a full-beam VIP aft on the lower deck. Balconies also expand and transform the spaces. The large guest accommodations did not come at the expense of the crew of 15. The crew area — 2,200 square feet— is logically organised into a professional laundry room, attractive cabins and practical galley, all with natural light. 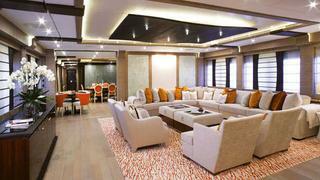 The finishes used are durable but attractive, an elegant gesture on an elegant yacht. Very few people will ever get to see Lady M on the inside, but wherever she goes, her stunning exterior turns heads.